When people think of the “it” hotspot in Asia, most of them think of Seminyak, the sparkling jewel in Bali’s crown. Just a decade ago Seminyak was little more than an obscure fishing village on the southern coast of Bali, but now after a vast amount of investment, it has become the most up market, modern town on the entire island. Chic boutiques, classy dining and stylish bars. A couple of temples ads a dash of culture to Bali's most upscale town. A wide stretch of sand with stunning sunsets. Bali's highests concentration of top restaurants..
Sunset cocktail sipping and stylish clubs. The waters can be a rough, but plenty of things to see for kids. Bali's most exclusive spas are found here. Book a tour with one of the local operators for some adventure. Pack your fins and snorkel and drive north-east for serious diving. Enter the beach at Ku De Ta and you have the break in front of you. It’s fair to say that people from all across the globe flock to Bali seeking their perfect island paradise. Like most of Bali’s coastal hotspots, Seminyak is host to several miles of sandy beaches, rimmed with beautiful blue waters. The breaks are popular among surfers and their isn’t a great deal to explore under the waves, which is good as it means that the beaches in Seminyak generally don’t get as busy as s some of the beaches in other coastal towns around Bali. The main attraction of Seminyak is its many upmarket boutiques and high-end health spas. Whilst health spas are fairly common sites in all of the tourist towns of Bali, none of them can compare to the sheer luxury available at the Seminyak spas. As for the boutiques in Seminyak, they are nothing like the typical tourist shops that inundate the other tourist towns. The boutiques supply the highest quality goods, with incredible offerings in both fashion and art being made available to the discerning clientele .Of course such things don’t come cheap, but if you want a taste of the high life, you can indulge in this in Seminyak. Nighttime in Seminyak is a real treat, as again it is much more refined than the frantic nightlife you’ll find in other parts of Bali. There are a wide selection of quality restaurants and bars to party the night away in, not to mention an incredibly active club scene for those who take their partying a bit more seriously. If you’re looking for a good time and you’re willing to invest in it, Seminyak is probably the best place in Bali to be. It’s easy to see why the Glitterati flock to this coastal paradise all year round, as the shopping, food and parties are second to none. 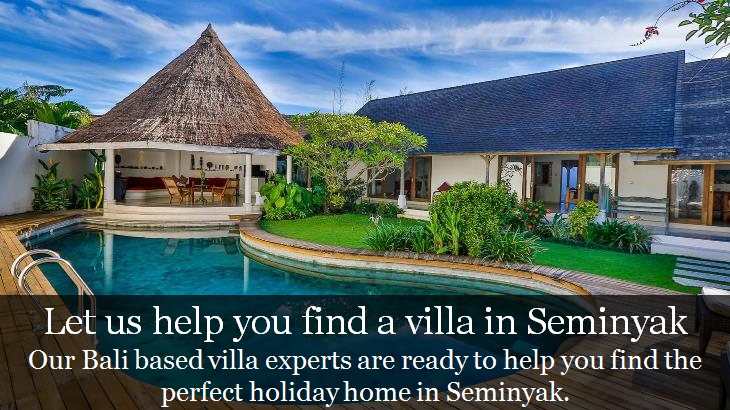 Most of the accommodation in Seminyak is made to an extremely high quality and is very modern, so no matter how you choose to spend your days (or nights), you should always have a fantastic place ready to rest your head – have a look at our Seminyak villas.